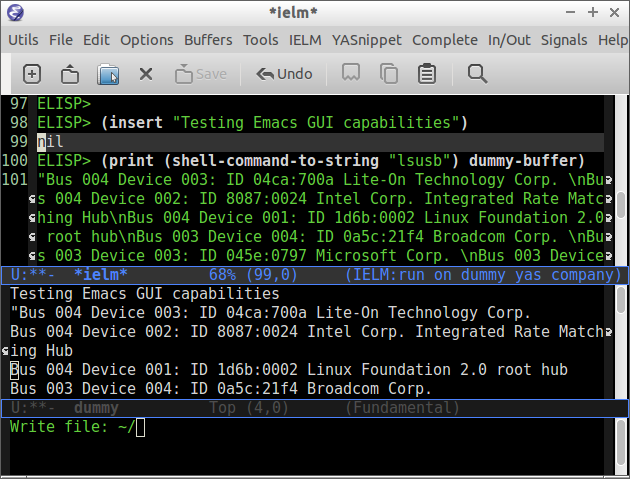 This section will use the Emacs interactive elisp shell IELM that can be accessed by typing M-x ielm. 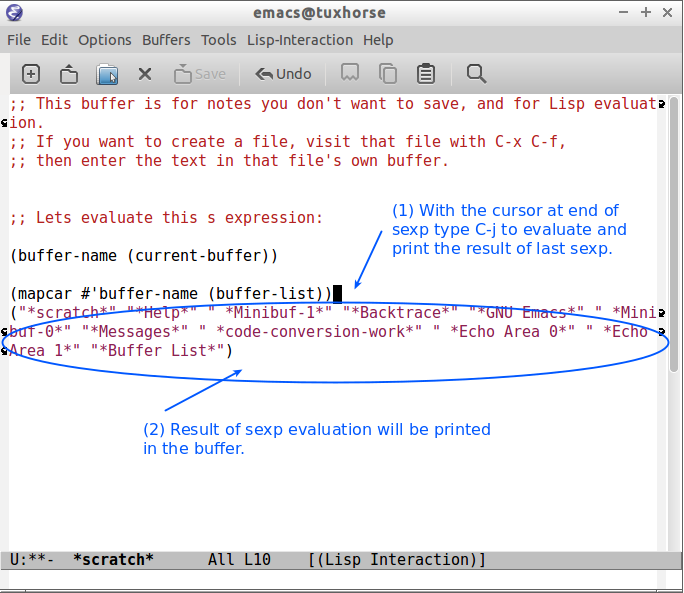 You can also use the scratch buffer to test Emacs features and elisp codes. 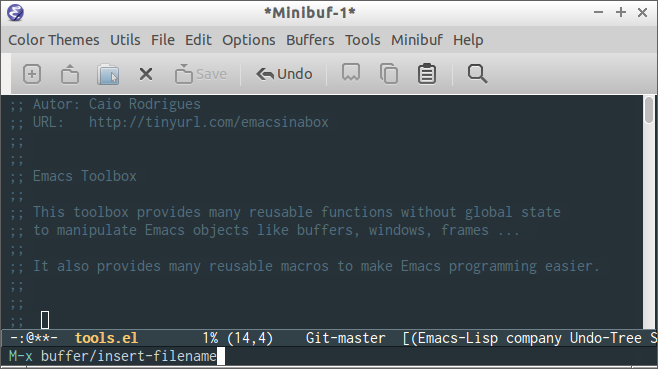 It is recommended to insert (require 'cl) in the Emacs init file that loads the library cl - Common Lisp Extension Library, that provides many useful common lisp functions and macros like remove-if, remove-if-not, cl-case and so on. 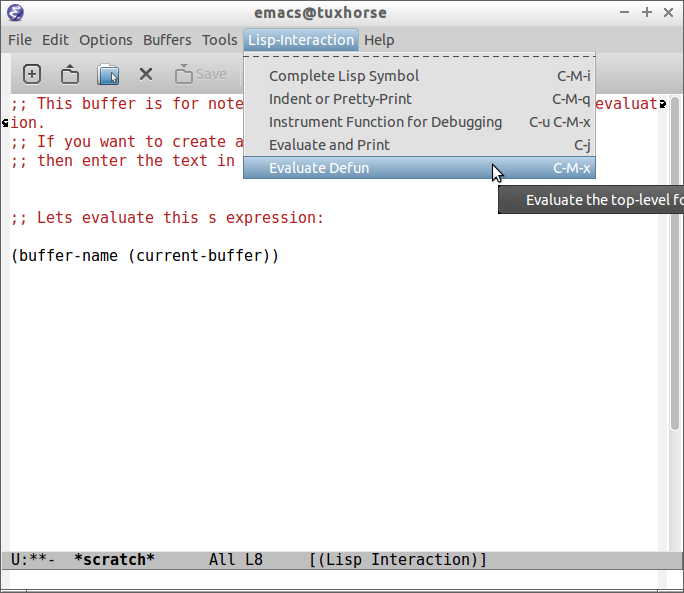 The scratch buffer is useful to evaluate Emacs lisp commands, test new features and test new Emacs configurations and dot emacs without need to reload Emacs. C-x C-e at the end of s-expression displays the result of evaluation in the minibuffer. C-j at the end of s-expression prints the result in the scratch buffer. 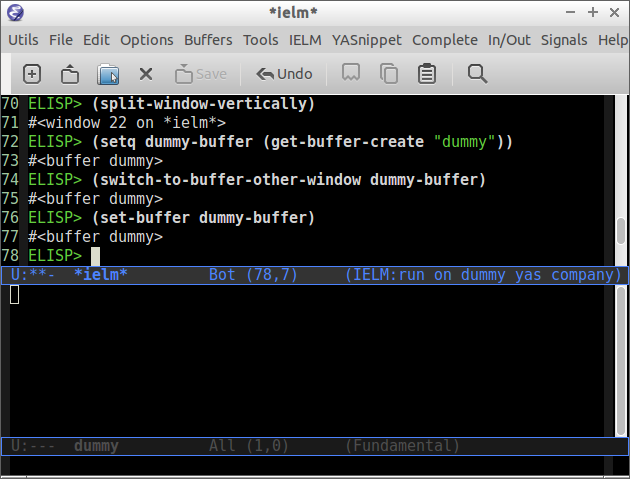 The scratch buffer can be used with the interpreter IELM, to open the interpreter type: C-x 3, put the cursor on the other window(C-x o) and type M-x ielm. 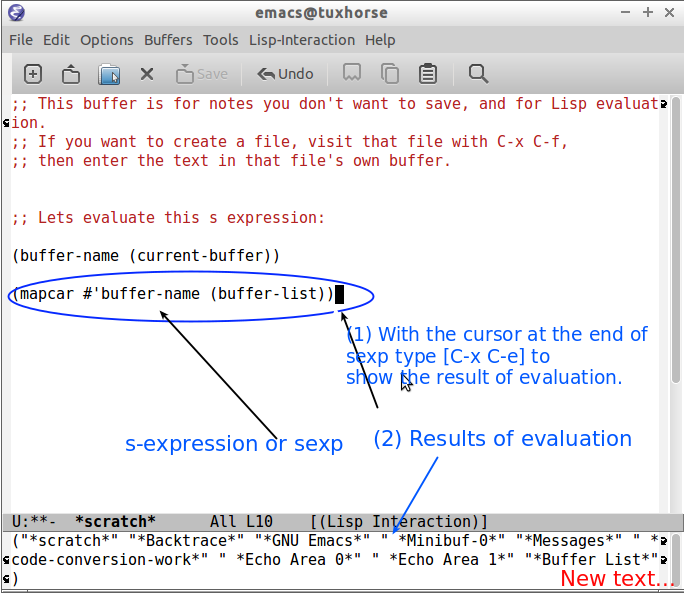 By this way it is possible to evaluate expressions in the scratch buffer and test it in the shell. 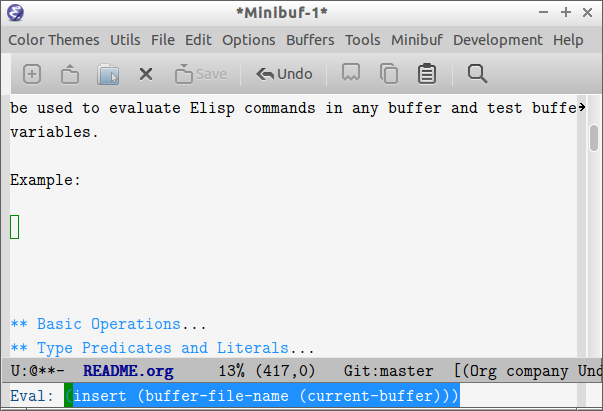 The command M-x eval-expression which is bound to the key bind M-: can be used to evaluate Elisp commands in any buffer and test buffer local variables. 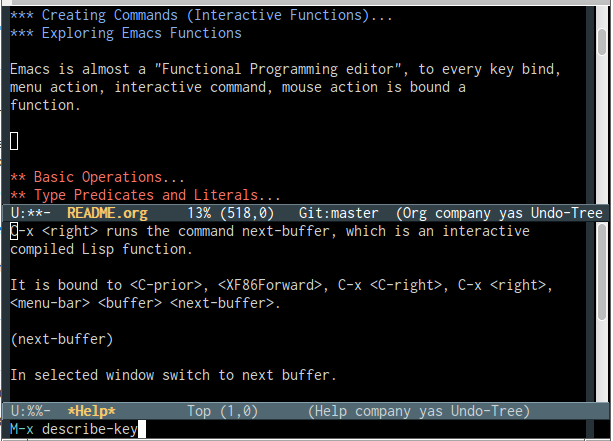 "Insert file name of current buffer at current point"
Emacs is almost a "Functional Programming editor", to every key bind, menu action, interactive command or mouse action is bound a function. For example: to the key bind C-x <right> is bound the interactive function next-buffer that can be executed with M-x next-buffer. To learn which function is bound to key type: M-x describe-key and then type the key binding like C-x <right> to pop up a window that shows the function bound to that key or just type C-h-k and type the key combination. 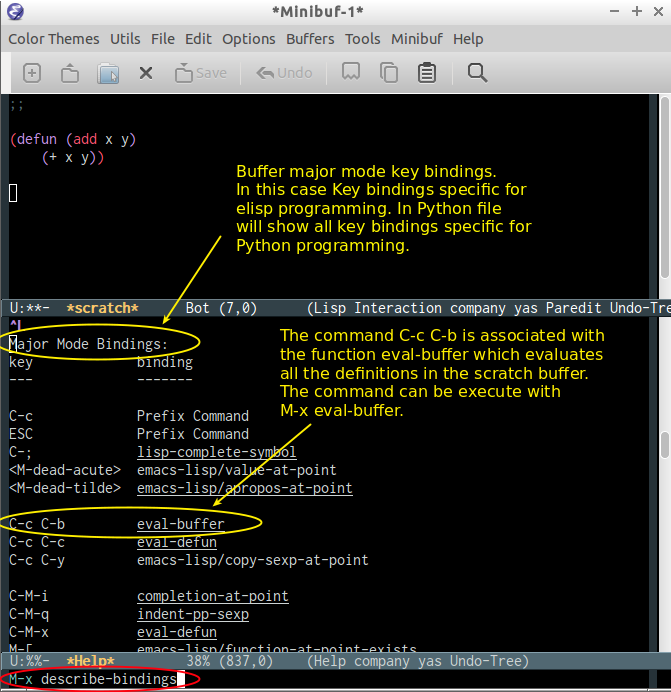 The command M-x describe-bindings or the key binding C-h b shows a list of all defined keys and all functions that are associated to them in all modes, including the buffer major mode. C-h b in the scratch buffer (Elisp interactive mode). The picture shows the major mode key bindings (elisp interactive mode) for the scratch buffer. This command also shows minor modes key bindings. If the user select the function pareddit-kill (which is associated with the key binding C-k in pareddit-mode) and type return, it will show the function documentation or what the key combination does. 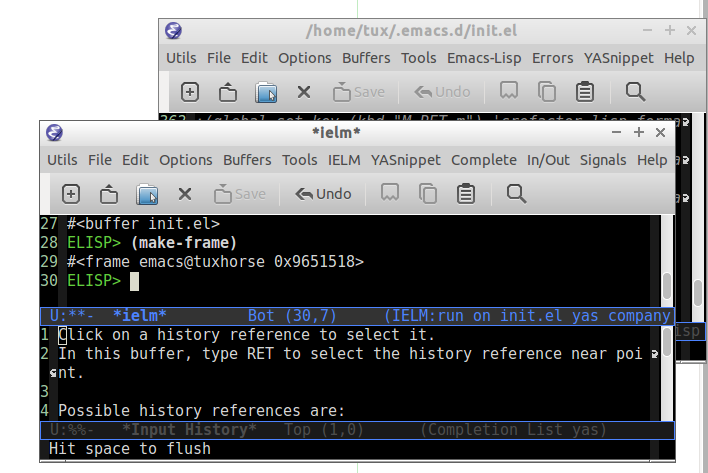 Emacs keeps an in-memory documentation of all functions. To see the documentation type M-x describe-function or C h k and type the function name or put the cursor at the beggining of the function name and type M-x describe-function. The packages paredit, rainbow-delimiters and company gives a better user experience when programming Elisp. 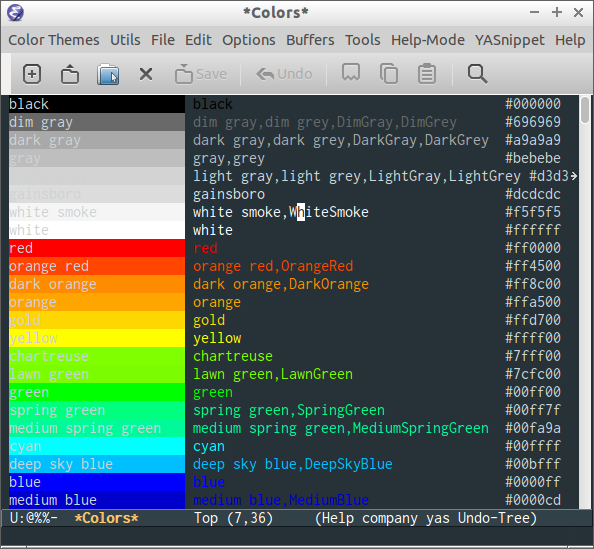 The package rainbow-delimiters provides different colors for parenthesis at different levels making easier to spot errors and s-expression, the package paredit allows structured and fast editing of s-expressions and company provides completion for Emacs-lisp statements like functions and variables. Paredit and rainbow-delimiters are not only useful for Elisp, they are also invaluable for other lisp dialects like Scheme, Common Lisp and Clojure. Install the packages if they are not installed yet. 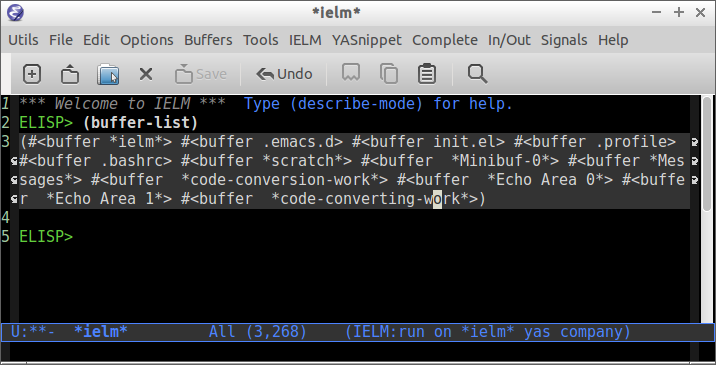 Enable paredit, rainbow-delimiters and show-paren-mode for Emacs lisp mode (mode to edit Emacs files *.el) and lisp-interaction-mode (mode to edit *scratch* buffer). 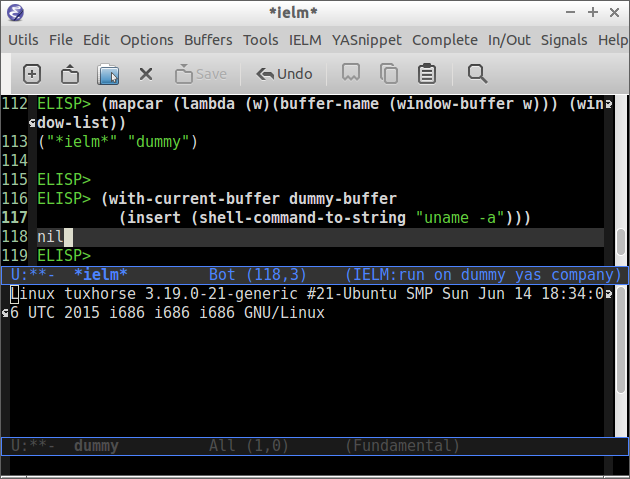 Set useful key bindings for IELM (Emacs-lisp interactive shell). RET Insert a new line, but doesn't send to the IELM process. 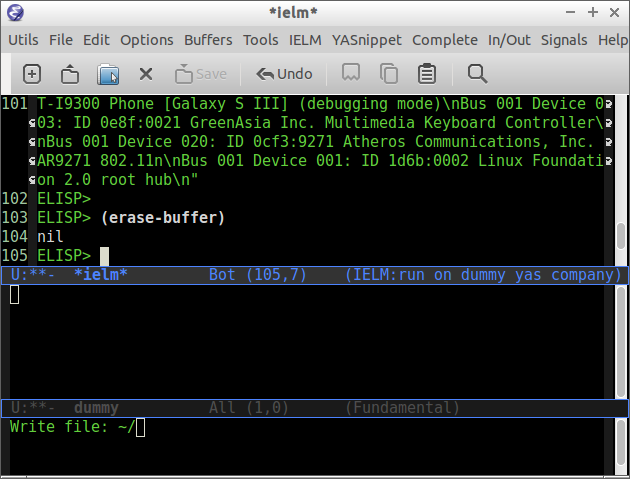 This setting allows multiline input and by typing M-RET (Alt + Return) sends the current input to IELM process. ELISP> "Hello World Emacs Literals"
"It is true (not nil)"
"It is false (it is nil)"
Number numberp 100, 200e3 Test if it is number. Symbol symbolp 'sym :keyworkd Test if it is a symbol. Atom atom 'x "h" :key 200 Everything that is not a list or pair is an atom. 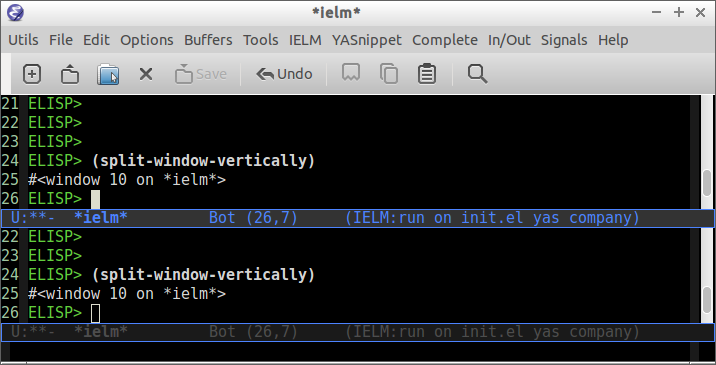 To enable closures put the expression below the ~/.emacs.d/init.el file. ;; An emacs list can contain elements of almost any type. ;; Removes first element of the list, returns the list tail. Not that in this list '(4 . (1 2 3 4)) becomes '(4 1 2 3 4) what makes this list ambiguous for associations with multiple elements. 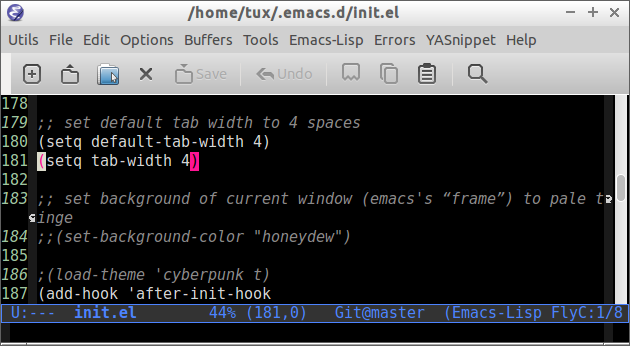 The list most used by Emacs API is the clist. This type of list is not ambiguous like the clist. Property lists are lists of consecutive pairs of keys and values. The advantage of this list is that it requires less parenthesis and it is more human readable. "Run Scala file with scala command"
;; Separates a property list into two lists of keys and values. read : Parse a s-expression. "(:x 10 :y 20 :z 30 :w \"hello world\")"
"(+ 1 (* 2 3))"
Evaluate the defun containing or after point, and print the value in the echo area (eval-defun). 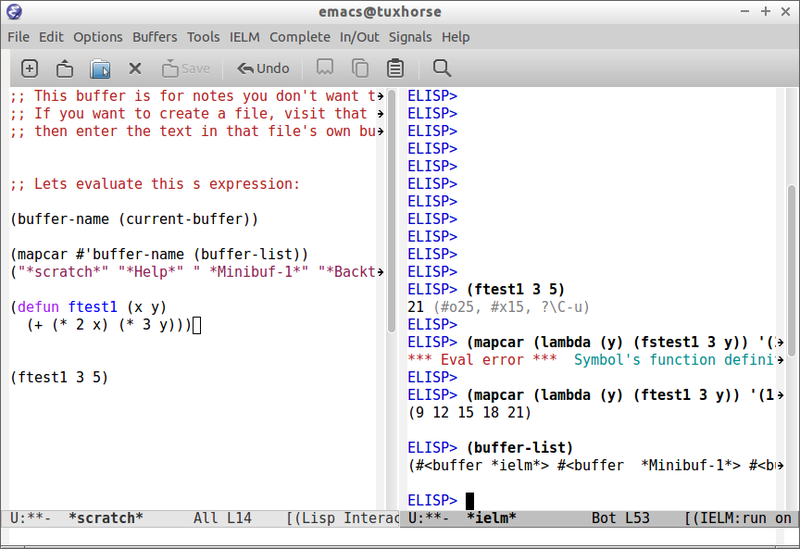 Evaluate all the Emacs Lisp expressions in the region. 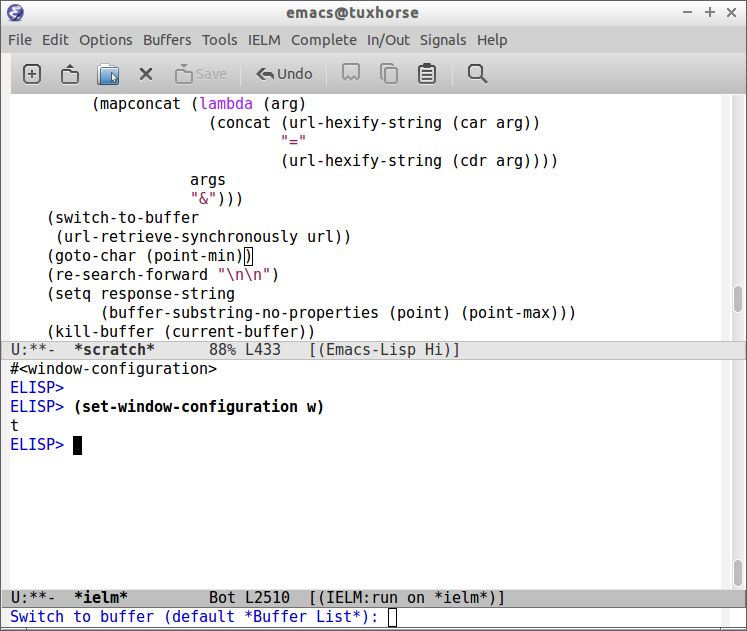 Evaluate all the Emacs Lisp expressions in the current buffer/ window. Open a prompt, request user input in current buffer and evalutes. 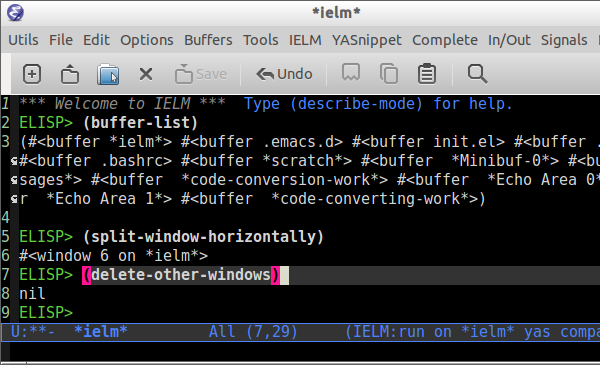 The built-in macro defalias allows to define short and convenient names for Emacs functions. ;;  the command M-x org2html will do so too. ;; Any value different from nil or '() is true, otherwise false. "greater or equal to 10"
Each variable definition introduces a variable that will be in scope in the body of the loop. The full form of a single variable definition is a list containing three elements. See also: Dash Library Github repository Dash is functional programming library to Emacs with many useful higher order functions. "Return function composed of FUNS." Interactive functions can be called using: M-x <function>. 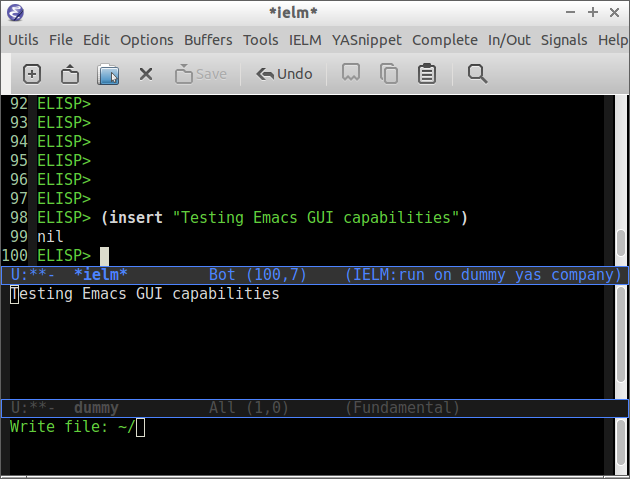 The user can create custom emacs commands with interactive functions. "Returns the major mode associated with a buffer." Apply a list of functions to a single argument. Macros are useful to create new lisp special forms like if and when, create new control structures, domain specific languages, eliminate boilerplate code, automate code and redefine syntax. 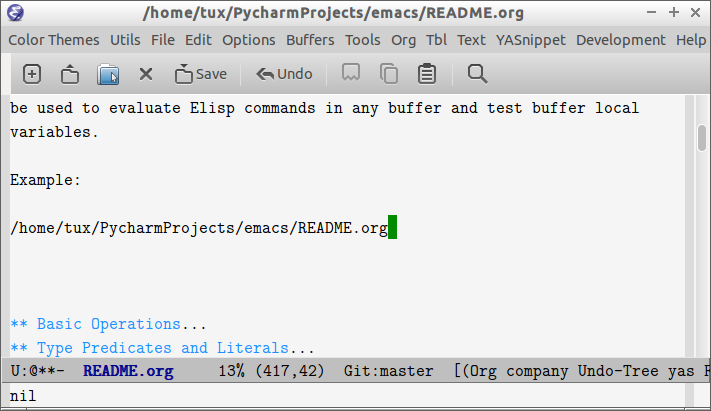 Elisp macro constructs has the same syntax of Common Lisp. Quasi-quote is useful to create s-expression templates, data structure templates and lisp macros. ;;; How does the macro work ? Bind new names to existing elisp functions in order to create user friendly identifiers, for example, bind the symbol map to the function mapcar. The function print can be replaced by message to display the debug message in the minibuffer. It is useful to debug callbacks. (print (format "%s = %s"
"(* 10 30) = 300"
"(+ 10 ($debug * 10 30)) = 310"
Point Cursor position, number of characters from beggining of the buffer to current cursor position. Buffer Place where the user edit something. Not all buffers are bound to a file. Mark Beginning of the selected area. No multi-thread support. However it can handle well subprocesses. No directly file access. A file cannot be read directly, it must be read to a buffer and then the buffer must be read. 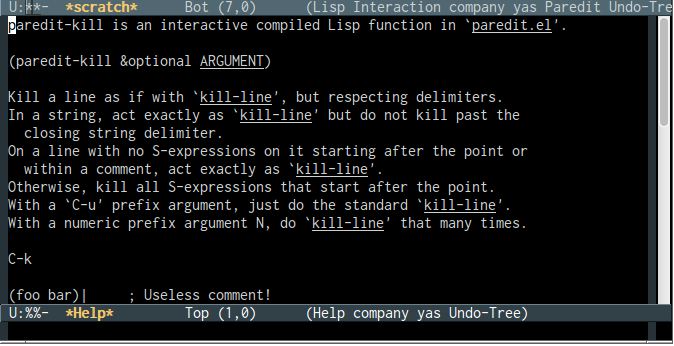 There is no lexical scope or closures in Emacs Lisp as there is in Common Lisp and Scheme, however macros can be used as a work around to overcome this limitation. No tail call elimination, so loops must be used instead of recursion. Despite the limitations of Emacs, it is one the few programmable text editors available, the ideal text editor would be a Scitilla IDE with a Emacs-like interface and a clojure-like programming language or Scheme. Emacs implementation on top of Kawa Scheme (Scheme on JVM). 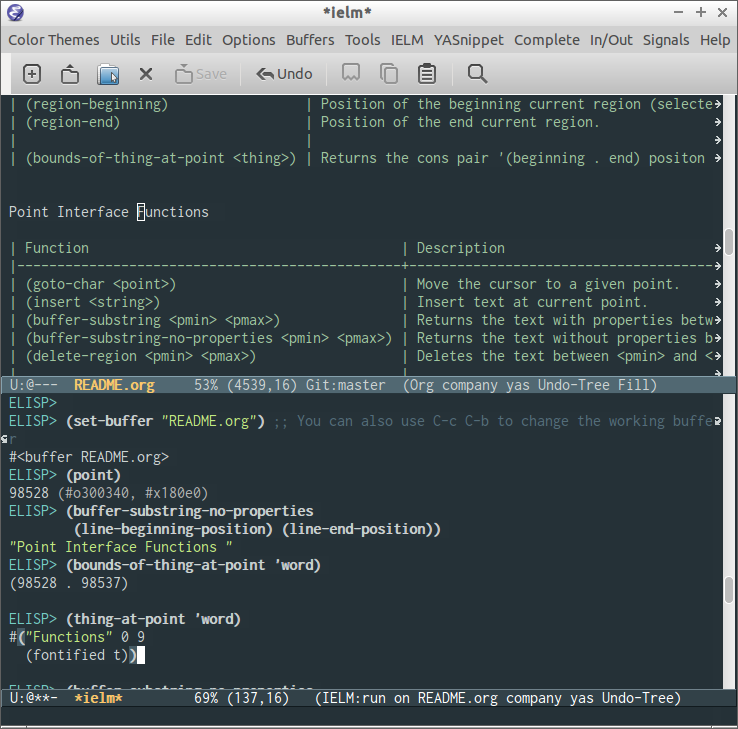 Deuce - An Emacs like editor implemented under Clojure, it stills a work in progress. 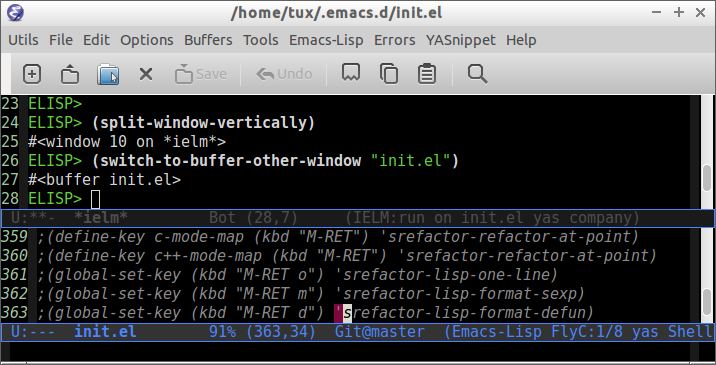 Emacs has more than 35 years of active development and no editor can beat it. 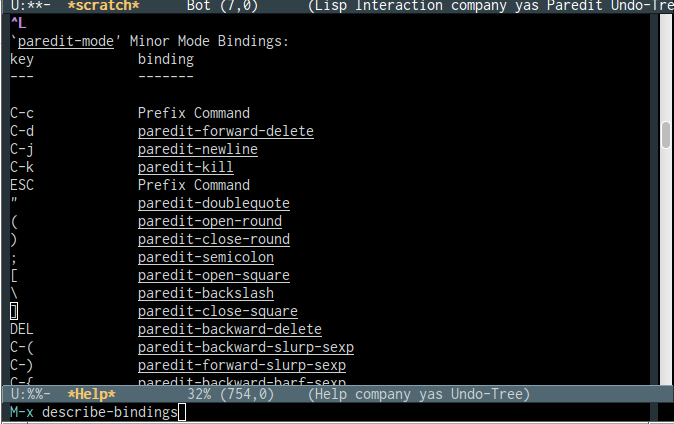 Why isn't more of CommonLisp in GNU Emacs? This calls the command describe-function. Type a function name and get documentation of it. This calls the command describe-variable. Type the name of a variable at the prompt and press return. This displays the variable's documentation and value. ("*ielm*" "Emacs.md" "*Help*" " *Minibuf-1*" "*shell*" "init.el" "*markdown-output*"
"*Popup Shell*" "dummy.el" " *Minibuf-0*" " *code-conversion-work*" "
*Echo Area 0*" " *Echo Area 1*" " *code-converting-work*" "pad" "*scratch*"
"List all opened files in the current session"
;; This function returns a buffer named  buffer-or-name. ;; buffer—this function does not change which buffer is current. "\n\nlet rec prodlist = function \n    |  ... "
"Get the text selected in current buffer as string"
"Get current line, where the cursor lies in the current buffer"
"Perform regular-expression replacement throughout buffer." Point is the number of characters from the beginning of the buffer to the current cursor location, or cursor position for short. To see the function documentation type C-h-f and enter the function name or M-x describe-function. (point-max) Maximum cursor position in current buffer. (line-beginning-position) Point of the beginning of current line. (line-end-position) Point of the end of current line. (region-beginning) Position of the beginning current region (selected text). (region-end) Position of the end current region. (bounds-of-thing-at-point <thing>) Returns the cons pair '(beginning . end) position of thing at point. (goto-char <point>) Move the cursor to a given point. (insert <string>) Insert text at current point. (buffer-substring [pmin] [pmax]) Returns the text with properties between the points <pmin> and <pmax>. (buffer-substring-no-properties [pmin] pmax]) Returns the text without properties between the points. (delete-region [pmin] [pmax]) Deletes the text between <pmin> and <pmax>. or enter C-c C-b when using the IELM. Return the THING at point THING should be a symbol specifying a type of syntactic entity. Possibilities include `symbol', `list', `sexp', `defun', `filename', `url', `email', `word', `sentence', `whitespace', `line', `number', and `page'. When the optional argument NO-PROPERTIES is non-nil, strip text properties from the return value. "(defun f (x y)\n             (+ (* 3 x) (* 4 y)))"
Display a message at the bottom of the screen. Display a message, in a dialog box if possible. If a dialog box is not available, use the echo area. 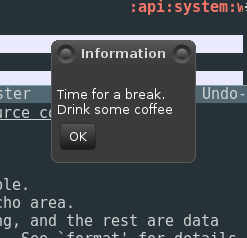 "Time for a break.\nDrink some coffee"
("." ".." ".git" ".gitignore" ".idea" "LICENSE" "Make" "Makefile"
"README.back.md" "README.html" "README.md" "Test.html" "build.sh" "clean.sh"
Original Window before be changed. Switch to Buffer on other window. Description: Split window vertically, create a new buffer not associated to a file named dummy, and switch to this buffer on the second window and set the current buffer to dummy. Description: Insert some text on the buffer dummy. Description: Redirect a shell command to the dummy buffer. 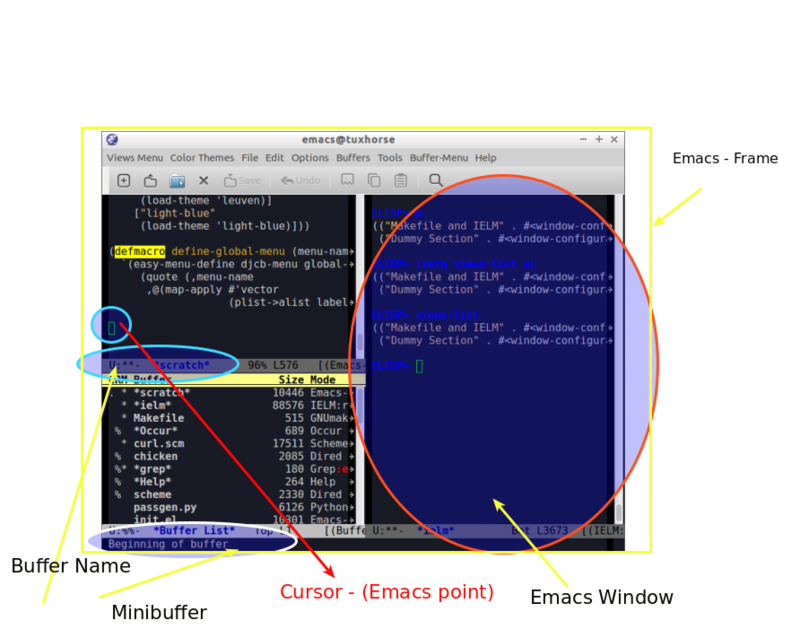 The function current-window-configuration returns the current emacs window configuration. ;; Change the windows, buffers and then restore the the current window. The variable system-type indicates the current operating system. gnu/kfreebsd GNU system with a FreeBSD kernel. "Sun Jun 21 06:10:28 2015"
"Linux tuxhorse 3.19.0-18-generic #18-Ubuntu SMP Tue May 19 18:30:59 UTC 2015 i686 i686 i686 GNU/Linux\n"
;;;; Get a process, given its name. Emacs will search for images *.xpm or *.xbm in all directories listed in the variable image-load-path. Emacs search for images by default at file:///usr/share/emacs/25.1/etc/images/ (Linux) directory that can change depending on current Emacs version and operating system. The program ImageMagick can be used to create Emacs-compatible icons that must have *.xpm or .xbm extension and have size 24x24 of pixels. Example 1: Add the icon index.xpm ( usr/share/emacs/25.1/etc/images ) to toolbar that when clicked call the command M-x compile or function compile. Label and help parameters are optional. #'compile                             ;; callback function that will run when user click. Example 2: Add the icon compile.xpm to toolbar and invoke the command M-x compile when clicked. #'recompile                           ;; callback function that will run when user click. Example 1: Create a menubar to org-mode with only two buttons. It will only be shown in org-mode. 'org-html-export-to-html           ;; Callback function that will be invoked when user click. Example 2: Create a menubar to org-mode with only two buttons removing the ones from tool-bar-map. The toolbar only will shown if the user open a org-file. :help "Launch Xfce4 terminal emulator." This function returns a timer object which you can use in cancel-timer. Example 1: Run a single time and then pop up a message box after 5 seconds. Example 3: Pop up a message showing that the coffee is ready after 3 minutes. 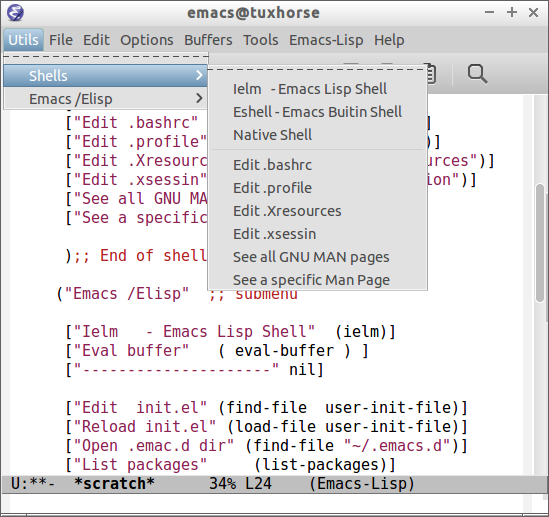 Inferior Modes are modes that runs as Emacs subprocess (generally a shell). The variable auto-mode-alist holds all modes associated with file extension. List all modes associated with file extensions. Query all file extensions associated with a mode. Get all file extension associated with a mode. The function define-key associates a key bind to function that will be called in a specific mode. To see what function is associated with a key bind type: M-x describe-key and then type the key bind. The following is a list of hook variables that let you provide functions to be called from within Emacs on suitable occasions. 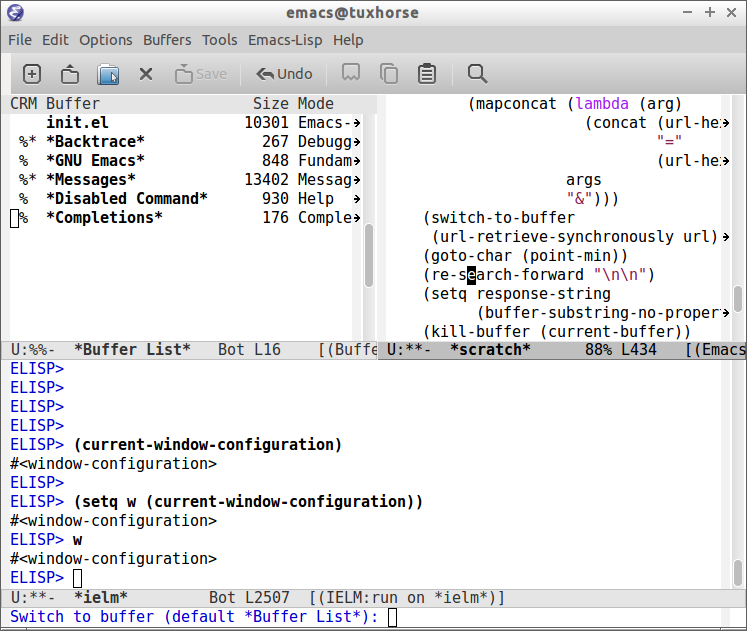 ;; Emacs Configuration File which is loaded at Emacs startup. ;; Directory where is the user configuration files. Simple tcp client examples in emacs elisp? 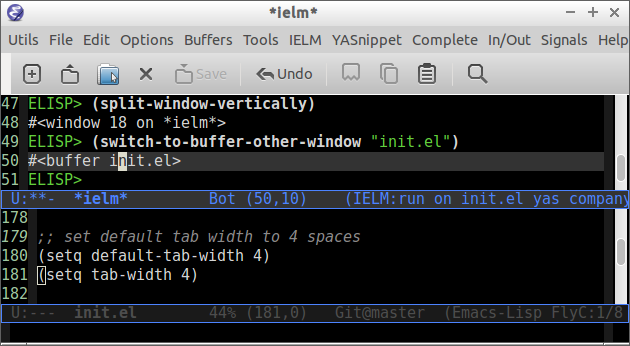 How do I use an already running Emacs from another window? Emacs tools and codes that can be useful as implementation references and proof of concepts about Emacs integration. 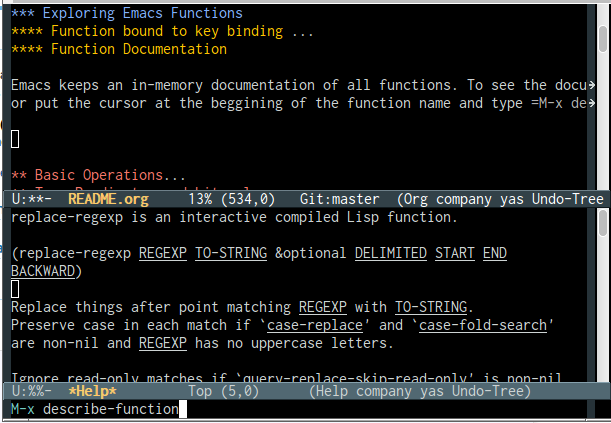 The Emacs regular expressions are different from the standard Perl regular expressions that are used by most languages. Note: The regex patterns entered in elisp code between "" quotes requires two backlashes. Example: The pattern \s- will match white space in M-x <commands>. To match white space in Elisp code the pattern must be written as "\\s-"
Note: Lookahead and lookbehind like in PCRE are not supported. Create customized commands to change or search source code. \1, \2, \3, \4 $1, $2, $3 Result of capture: search, replace. rx is an emacs built-in macro inspired by Olin Shivers' Scheme Shell: schsh rx-notation that allows to encode regular expressions in s-expressions expressive and readable way and also to build complex regex patterns.
" cata rat rat dograt dog cat2334 23rat2"
" cata   dograt  cat2334 23rat2"
"(cat) cata (rat) (rat) dograt (dog) cat2334 23rat2"
It will open a window to select the color theme. It will show a GUI with all customizations and options. C-c M-p will launch a terminal lxterminal (That is only available for Linux, although it can be tweaked for another terminal emulator or OS) in the current file directory. ;;; This function can be called by typing M-x launch-terminal in any buffer. It will insert the current date in the format: 2015-10-20 at the current cursor position. 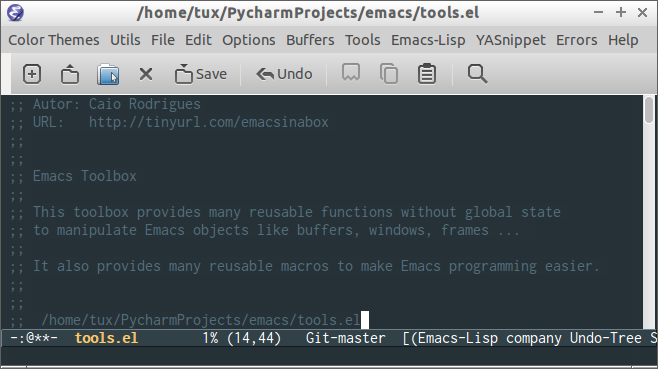 It will open a Emacs developement window whatever the current frames opened. 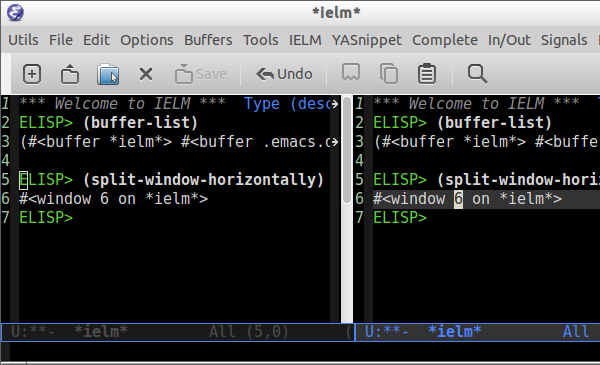 It will split the curent frame (window) verically and swithc to scratch buffer in the left and the emacs shell in the right side. Put the cursor at beggining of an URL and type C-c M-u (Ctrl-c + Alt-u) to open the URL in the web browser. ;; with minimum amount of parenthesis as possible. F8 will do the same thing as A-x <command>. Ctrl-d will delete the entire word under the cursor.